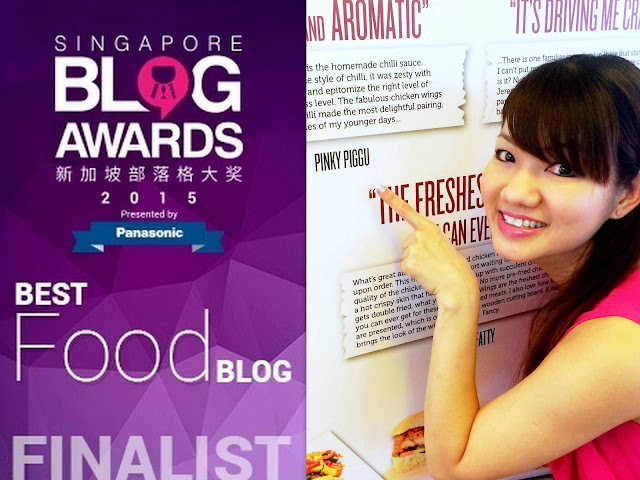 PinkyPiggu: Singapore Blog Awards 2015 ~ PinkyPiggu Is In The Finals For BEST FOOD BLOG! Singapore Blog Awards 2015 ~ PinkyPiggu Is In The Finals For BEST FOOD BLOG! PinkyPiggu is in the Singapore Blog Award's finals again this year for BEST FOOD BLOG! Much thanks to you who is supportive of this little space here where I share my dining experiences and cooking experiments. Now into its 8th year, what differs this time round is that the winner of Best Food Blog will be determined fully (100%) through scoring by a panel of judges. (It was based on 70% judging and 30% voting for previous years). But not to take out all the fun, supporters can still vote for their Top 10 Most Popular Blogs. I believe lucky voters stand to win some prizes too. Voting period has already started from now till 6th July 2015. Watch this space for updates when results will be announced during the awards ceremony sometime in July. Singapore Blog Awards 2014 ~ The Announcement of Winners + Sneak Preview of PinkyPiggu's YouTube Channel! The Yumminess of Pumpkin Cake with Salted Egg Yolk ~ Recipes Included! Miso Chicken Wing Rice using Panasonic Rice Cooker ~ Recipe Included! Avocado Gula Melaka Smoothie & Dessert ~ Recipes Included!